With an influx of blinds making companies in recent years, choosing the best one has never been easy. It has become more of a hurdle than a benefit of having more options to choose from. To compound it further, companies like Bali and Levolor have had to battle it on the same ground with the same terms – in terms of similarities in the wears that they deal with. However, it seems to be a healthy competition since Bali.com lists some blinds from Levolor. Regardless of the wears being almost similar, these two companies enjoy a range of particular traits. The characteristics separate each one from the other and would help a potential customer make a better choice between them. This post, therefore, seeks to bring out the main differences between Bali and Levolor. However, the post does not give an opinion of which company is better than the other. In addition, it does not seek to influence your decision on whom to stick with between the two blind makers. Bali is an American blind maker with over 150 years of industrial presence. Even though the main brand was born in the 1960s, the journey started around 1860s. It was born with the launching of a 1-inch Bali Custom Mini Brand, and the rest has been history. Around the 1980s, a half-inch Bali Mini Bind was born. The narrower slats added both a sleek and modern look to businesses as well as homes. Shortly, the Bali brand added more blinds including vertical and pleated fabric blinds to enhance more creative possibilities. Also, an all-in-one cord control, the Bali Ultra Band Blind was also invented. Levolor, also doing business as Levolor Window Fashions is an American manufacturer of custom window shades and blinds as well as stock blinds and shades. It was founded in Hoboken N.J in 1914 by one H.K Lorentzen. Currently, it is headquartered in Atlanta, Georgia with corporate offices in Newell Rubbermaid (since it was acquired by Newell Brands and later by Hunter Douglas in July 2016. Levolor has operations in the United States, Mexico, Canada, and China. Also, Levolor customers can buy products from several major retailers that include Lowe’s, Home Depot, RONA, JC Penney’s, among other independent dealers and stores. The Bali brand was born in Philadelphia, Pennsylvania in 1860 but later moved to its current headquarters in Middleton, WI. The customer service center is, however, still in the original Pennsylvania location. Levolor, on the other hand, was born in Hoboken N.J in 1914. In 1993, Newell (now known as Newell Brands) acquired it. The acquisition later went to Hunter Douglas (another custom window blind manufacturer) in 2016. It then moved its headquarters to Atlanta, GA under the umbrella of Hunter Douglas. Bali’s main products include Bali Wood Blinds, Shutters, Bali Solar Shades, handcrafted Bali Drapery, Layered Shades, and airy and modern Bali Sheer. Others are wood blinds, faux wood blinds, vertical blinds, aluminum mini blinds, roman shades, woven wood shades, cell shades, and roller shades. Levolor’s products include Accordia light filtering cellular shades, 2” Visions Faux Wood Blinds, 2” Premium Wood Blinds, and Levolor PVC Verticals. 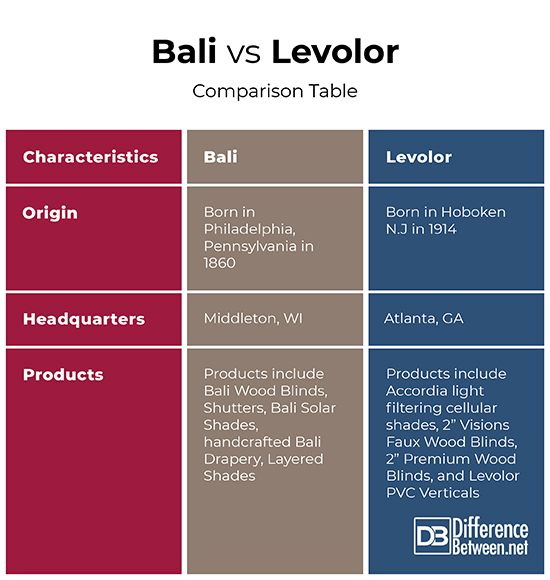 Bali Blinds holds at least 66 patents while Levolor had approximately 31 patents. Bali Blinds employs around 5,000 people while Levolor, as a company on its own, has between 100-150 employees. These are among the many others under Hunter Douglas as a parent organization which has over 10000 employees. Bali Blinds offers a range of warranties. Its warranties cover original defects in craft or materials provided the original buyer still owns the product and as long as the product was properly installed. The warranty also covers all components, internal mechanisms, and brackets. A 3-year warranty is also issued on products from the date of purchase. This warrant covers pleated shades without looped tape, operating cords, vertical blind vanes, and 2” horizontal vinyl blind stats. Also, there is a 5-year warranty on motorization accessories and components (excluding batteries), fabric tailored shades and accessories, draperies, fabric covered cornices, and valances, and exterior solar shades. Levolor, on the other hand, has a limited lifetime warranty on enclosed products to original residential, retail buyers. This warranty is only valid if the product was installed properly and it remains in the original window. The cover is usually against manufacturing defects that may cause it to stop functioning. Other warranties are ten years for roman, cellular, banded, roller, natural, and panel track shades. Others with 10-year warranties include metal, real wood, and vertical blinds (except vertical vinyl vanes), faux wood blinds, soft vertical blinds, and sheer shadings. Shutters and vertical vinyl vanes get 25 and 3-year warranties respectively. Even though the two companies deal with almost similar products, they have their share of characteristics that make them different from each other. From the dates that they were born to the different products that they sell, you would not fail to note their differences down. All in all, Blind.com has been selling blinds from Levolor for quite a while which means they are not hostile competitors. The only task is for the customer to make a decision on what they would want to work with or what to shop and from which company. Sarah Brown. "Difference Between Bali And Levolor." DifferenceBetween.net. January 29, 2019 < http://www.differencebetween.net/business/difference-between-bali-and-levolor/ >. "Welcome To LEVOLOR Online". Levolor.Com, 2018, https://www.levolor.com/. Accessed 19 Dec 2018. Serven, Benjamin. "Why Choose Bali Blinds? - Top Of The Line Blind Design - The Finishing Touch". The Finishing Touch, 2018, https://www.blinds.com/blog/bali-blinds/. Accessed 19 Dec 2018. "Our Story | Bali Blinds And Shades". Bali Blinds, 2018, https://www.baliblinds.com/why-bali/our-story/. Accessed 19 Dec 2018. "LEVOLOR® Limited Lifetime Warranty". Levolor.Com, 2018, https://www.levolor.com/support/warranty. Accessed 19 Dec 2018.